Fashion Truffles: Happy Love Day! Happy Valentine's Day, luvies! I hope your day is filled with smiles, good friends, tasty treats, lots of love, pretty flowers, and a little cuddling. And, in honor of all things red and white, here are my colorful picks for a perfect day filled with love. I want those shorts and those toms! Happy Valentine's Day my love! You can feel free to gift me that Chloe bag! LOL. loving that white lace skirt! Happy Valentine's Day! I love the TOMS! Awe, love it all. I love how this day brings out so much happiness in people!! can't stop smiling! Happy Heart Day! Good gracious those Louboutins. Heart-stoppers. Happy v-day Viv! Absolutely loving these suggestions! 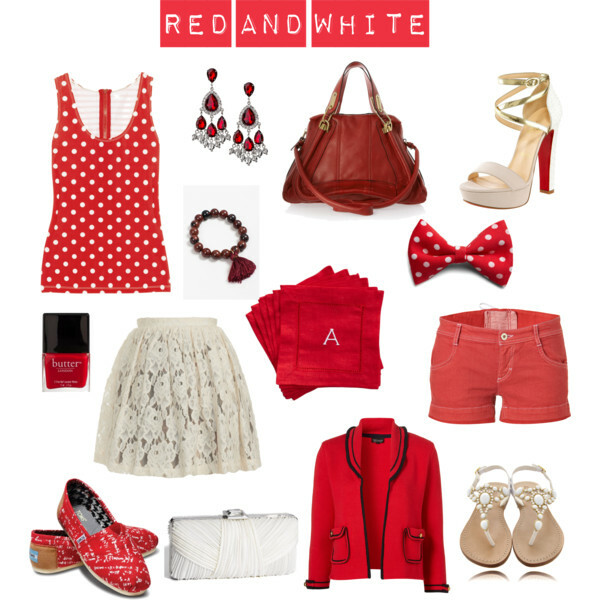 The white skirt is GORGEOUS (and actually in my price range) and those red and white Toms are adorable!. Thanks Viv! Love your picks esp the lace skirt. Perfect for Valentines. love all that red! hope this love day is treating you well! Great pieces! That white lace skirt and red blazer are amazing! Adorable! I love Butter nail polish!! I'll take the blazer and the polka dot tank please! hope you had a special day! Leave a comment - I love to hear from you! Unless otherwise specified, all content and photographs were created by me. You may feel free to use photos from this site, but please always link back. Fashion Truffles works with third-party affiliates and advertising companies to serve advertisers. These companies may use aggregated information (not including your name, address, email or telephone number) about your visits to this website in order to provide advertisements about products and services that may be of interest specifically to you. If you would like more information about this practice and to know your choices about not having this information used by these companies, click here. In some cases, Fashion Truffles uses affiliate programs and advertising to monetize content. If you click on a link to make a purchase or get more content, it may result in a commission. In addition, sometimes I’ll share affiliate links of retailers that I personally support via Twitter or Facebook. You’re under no obligation to click through when shopping online, but, if you do, you’ll be supporting my blog as well. Lastly, please note that all opinions expressed in this blog are my own. If you have any questions (any at all) please do not hesitate to contact me.